The man was arrested at arrivals yesterday evening. 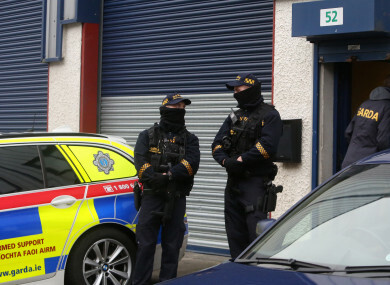 Stock photo of Garda Armed Response Unit. GARDAÍ HAVE ARRESTED a man at Dublin Airport for conspiracy to murder a member of the Hutch gang. The Kinahan associate was detained in the arrivals hall of the airport at around 7pm yesterday evening. The man has been under garda surveillance for a considerable period of time and has been a target of officers investigating gangland Dublin. The man was arrested under Section 50 of the Criminal Justice Act and can be held for a week before he must be charged or released. Email “Gardaí arrest Kinahan associate at Dublin Airport over conspiracy to murder”. Feedback on “Gardaí arrest Kinahan associate at Dublin Airport over conspiracy to murder”.